I had made a lot of photo book for myself before I decided to give a go to self-publish one. Today, I had successfully published 「Penang Record 2015」and recently a photo zine 「 Home Town」(Original post at date Aug 2016). 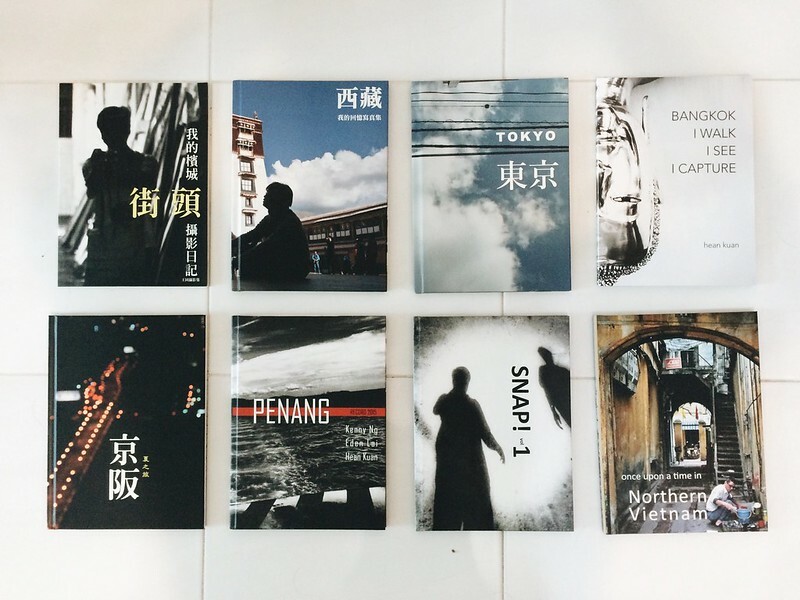 And now I recalled, how far the journey was, to have the courage to self-publish a photo book. I remembered at that moment I decided to publish one, I persuaded myself, “Give a go or give up!” And I give a go. My journey of making photo book began after the Kyoto-Osaka trip in 2012. Kyoto-Osaka trip was a very important trip for me. The promotional air ticket was bought a year ago, and I bought my first camera. You see, I am so looking forward to traveling Japan. I was a Japanese manga fan (most of the kids at my generation are the manga fans), I actually drew my own version of ‘dragon balls’ manga and made them into a comic zine (without knowing that was a comic zine) and pass around for friends to read, that happened during my primary school. After growing up a little, I turn out to be a Japanese drama fan ( most of the teenagers at my generation are Japanese drama fans too). I was influenced by Japanese culture through the mangas and dramas during my schooling time, that is the reason I am so into traveling Japan. That was why the Kyoto-Osaka trip meant a lot to me, and I urged to buy a camera to record my trip. And It was still not satisfying, I urged to make a photo book of it for the remembrance. I experimenting on how to place the images and text right, and it carried on for a few books, but I found myself was always not satisfying with the outcome, no matter how I arranged them, is still wrong. Until a day, I decided to arrange my photos in full bleed for all the pages. And with that arrangement, I was finally satisfied with the outcome. I discovered that I love full bleed, is not that it doesn’t waste pages, is because I find it allows me to blend in easily as a viewer. While opening the pages with two hands holding each edge left and right, it forms a cubical space between me(the reader) and the book. With full bleed of images, it somehow forms a connection between me and the subject. There are no frames to remind me that I am the one who did the staring, sometimes I may even think that the someone in the book is actually looking at me, telling me his/her’s stories. When coming to landscape, cityscape or buildings, it is even better to make them full bleed. I wanted to go into the scene so eagerly, any frames or text will distract me from blending in. The text is informative, I found a lot of magazines, they like to overlap the text in the empty space of an image. Although they are still full bleed, by doing that, the text may distract me, and even worse if it was not arranged it nicely, it spoils the mood. But then, the text is still important, to tell a story that can’t be told from the images. Therefore I may arrange them on another spread or page. I realized one of my early photobooks, I put captions to explain the image. It is embarrassing for me to look at it right now. As if the images can’t tell the story that I have to put a caption to explain it to the readers. Hey, you are looking at a performer, because the caption is ‘the performer’. If the image can’t tell the story, no matter how fantastic my caption goes, it brings no benefit. After all, it is not a magazine that I am making, it is my personal photo book, therefore those captions really redundant. Sometimes, I think the captions should belong to the viewer. When a photo became viral somehow, a name will be given to that photographs, so that it can be easy to identify or mentioned in the article. Well, I see mistakes, silly stuff in my early days of the photo book, I recalled when I received the book sometimes I so regretted and upset. I feel upset because it doesn’t turn out as what I had imagined. It looks fine at the computer screen but it doesn’t work on the physical book. But then, when I look back these silly, mistakenly arranged photo book, I felt warm now. It records my footprint, my journey of making photo books, it leaves a trace for my improvement in making books. Without those days of making books for myself, I won’t go this far. Note: Original post was written at Aug 2016 at the Blogspot.